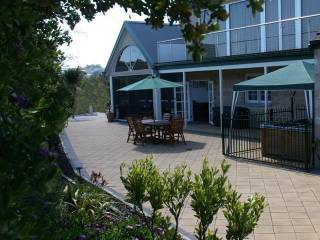 Moonah Ridge is fully air conditioned for guests comfort and able to accommodate couples, families and large groups in luxury and complete privacy. Offering two wings consisting of 7 bedrooms, 4 bathrooms and 4 living areas. 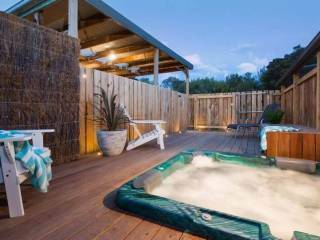 Moonah Ridge is a modern beach house offering luxury holiday rental accommodation located in southern Victoria on the beautiful Mornington Peninsula, with spectacular views over St Andrew’s Beach Rye and the rural hinterland affording breathtaking sunrises and magnificent sunsets. The beach house is spread over two wings with the East Wing comprising 4 bedrooms, 2 bathrooms, en-suite with spa, main living room overlooking the rural hinterland, large family kitchen living area overlooking the ocean. The West Wing can be accessed from the East Wing living area, has separate entry from the undercover entrance and comprises an extra 3 bedrooms, 2 bathrooms, one with spa, and 2 living areas making the beach house suitable for large groups of up to 16 people. Main bedroom with QS bed, en-suite with corner spa bath and small private balcony. Media-Theatre room with OHP TV, Foxtel, DVD, Video, Hi Fi equipment, Games machines and plenty of seating. 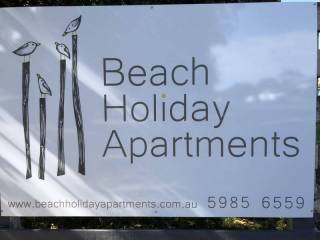 Full laundry facilities including clothes dryer. 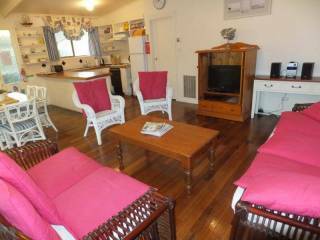 Living/dining area with TV, Video and Hi Fi equipment, telescope and kitchenette with microwave and refrigerator. 2 bedrooms with triple bunk sets comprising 1 double bed and 1 single bed each.